Magic Rock are another one of those breweries that rarely disappoints. They are very ‘craft’, and the hysteria that sometimes surrounds some of their releases (I’m looking at you, Unhuman Cannonball) is a little daft, but it’s hard to deny that they make some very, very tasty beers. 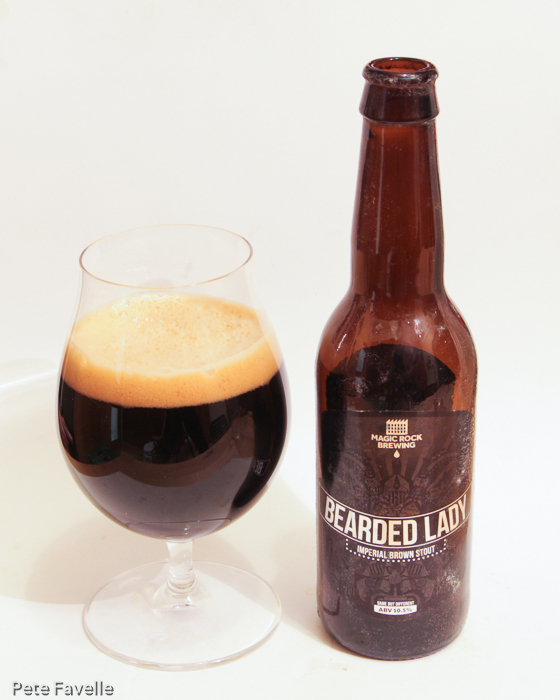 Bearded Lady is a 10.5% ABV imperial brown stout. It’s a jet black beer with a fine textured, dark tan head. The nose is full of coffee, with undercurrents of darkly toasted malts. In the mouth it’s a properly powerful beer; sticky burnt caramel, bitter dark coffee and dark dried fruit all blending into a wonderful assault on the tastebuds. The carbonation is soft and foamy, breaking up the syrupy sweetness and the bitter notes perfectly. There is a touch of warming alcohol but it’s well controlled, almost to the point of understated. The dry, resinous finish rumbles on forever, encouraging you to take just one more sip until the glass is depressingly empty. It’s a sign of a good beer when you’re left with a profound regret that you only bought one bottle. This is wonderful, big, monsterous beer – 4.5 stars.